Seven Rats Table Light | OhGizmo! By Evan Ackerman on 10/21/08 • Leave a comment! Unlike most pieces of functional artwork, the Seven Rats Table Light doesn’t seem to be making any sort of Statement and may just be weird for the sake of being weird. 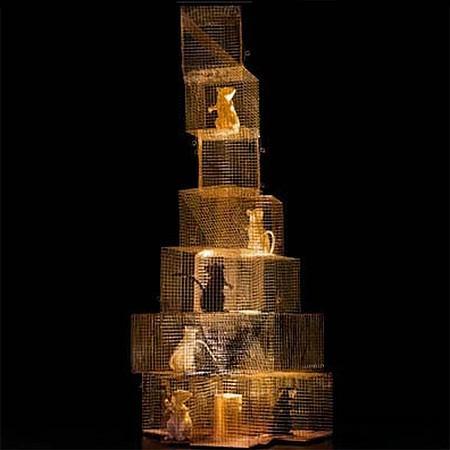 Designed by Ingo Maurer “and team” (whatever that means) the light sculpture is made of steel, gold, brass, and plastic cages which contain three black and four white rats (plastic rats, calm down), and the whole thing is lit from the bottom with a 50 watt halogen bulb. Oh, wait. I know what this lamp-thing is all about. It’s so obvious, that’s why they don’t spell it out for you. Clearly, it symbolizes the subconscious obsession of the human race with subjugating nature to create a schism between mind and body that satisfies our materialist and consumerist super-egos while illustrating the conflict between self and other in the context of subliminal racial pressures via a visual exposition of our primal instincts through Plato’s cave allegory. It’s so simple. No matter how incredibly deep the underlying meaning of this thing is, the $4680 cost means that it would be far, far cheaper to make this light fixture with real cages and real rats. And I bet if you connected all the cages and added some comfy hammocks, the rats (two perhaps, not seven) might even enjoy the setup. And you probably would enjoy it a lot more, too, having some fuzzy little ratties to keep you company instead of a really, really weird sculpture with (okay, I admit it) an incomprehensible meaning.